Showing 1 to 25 of 105. Just outside Washington, D.C., Goddard is home to hundreds of scientific missions. We operate Hubble. We manage communications between mission control and astronauts aboard the International Space Station. our scientists stare into the Sun, grind up meteorites for signs of life's building blocks, look into the farthest reaches of space, and untangle the mysteries of our own changing world. Goddard engineers construct sensitive instruments, build telescopes that peer into the cosmos, and operate the test chambers that ensure those satellites' survival. Enjoy some of the highlights from our 2018 trip around the Sun! An observational technique first proposed more than four decades ago to measure three important processes necessary for the formation of the solar wind — the source of disturbances in Earth’s upper atmosphere — will be demonstrated for the first time next year. Goddard heliophysicists Nat Gopalswamy and Jeff Newmark plan to demonstrate BITSE — short for the Balloon-borne Investigation of Temperature and Speed of Electrons in the corona — aboard a high-altitude scientific balloon from Ft. Sumner, New Mexico, next fall. BITSE will detect the density, temperature, and speed of electrons in the corona. The story appears starting on page 7 in Goddard's "Cutting Edge" technology magazine. SEEC: New Exoplanet Collaboration Seeks to Answer Age-Old Question: Are We Alone? Goddard scientists Avi Mandell and Elisa Quintana are among the scientists participating in the Sellers Exoplanet Environment Collaboration, a cross-disciplinary research effort named after the late Piers Sellers. The collaboration is now funding 16 cross-disciplinary research teams that are working with already-existing analytical tools, such as 3-D general-circulation and stellar-outflow models, to see how they could be adapted or modified to run simulations that would advance exoplanet science. The story runs in Goddard's technology magazine, "Cutting Edge" starting on page 13. The 2018 science intern award winners are Natasha Dacic, Alexandra Hanselman, and Katherine Melbourne. They are pictured here with Colleen Hartman, Blanche Meeson, and Raquel Marshall from the education office. Jane Rigby is the winner of the 2018 John C. Lindsay Award for Space Science. Jane is being recognized for her leadership on the Magellan Evolution of Galaxies Spectroscopic and Ultraviolet Reference Atlas (Megasaura). Jane has led the Megasaura project since its inception in 2010. The Science Jamboree on July 25th provided an opportunity to learn more about the amazing breadth of science conducted at Goddard while connecting with colleagues and potential collaborators. Photos of the event are available. We are thrilled to announce the selection of Anne Thompson as the 2018 Nordberg Award winner. Anne’s incredibly wide ranging research and service, nationally and internationally, makes her such a deserving recipient of this award. Although her research focuses on tropospheric chemistry, it has spanned a broad realm of Earth Science, including seminar work in air/sea exchange of trace gases, the importance of stratosphere-troposphere exchange for ozone, and the interconnection of atmospheric composition and climate. Anne has spent a large part of her time in the chemistry lab as well as in the field, characterizing the distribution of tropospheric ozone from satellites and ground-based measurements. Anne has been President of the Commission on Atmospheric Chemistry and Global Pollution where she led efforts to coordinate global research. She is Co-Chair of the Steering Committee for the Network for the Detection of Atmospheric Composition Change. Anne is a Fellow of the AMS, AGU and AAAS and she has been elected President of the Atmospheric Sciences Section of the AGU and AMS Councils. Anne engages people and brings them together to form measurement networks. She has been a driving force in forging the link between ground, suborbital and satellite observations in ozone. Somehow, Anne has also managed to put the training of young scientists in the US and abroad on the front-burner as well. Her research has resulted in more than 260 referred papers and an H-index of >54. Anne is a leader of people, technology and science. On May 21-22, 2018, over 100 colleagues from around the globe gathered at the National Academy of Sciences in Washington, D.C., to celebrate the life and career of Neil Gehrels at a memorial symposium. Talks spanned the range of Neil’s scientific interests (cosmic rays, gamma-ray bursts, gravitational waves) and programmatic roles (Compton, Swift, Fermi, and WFIRST), as well as personal reminiscences of a universally admired mentor, colleague, and friend. We were also pleased to publicly announce that, as a result of a generous donation from the Gehrels family, the nationally recognized prize doctoral position offered by the Joint Space-Science Institute will be renamed the Neil Gehrels Prize Postdoctoral Fellowship. Experts from Codes 500 and 600 presented their work to Thomas Zurbuchen during a poster session on May 29. From left to right: Colleen Hartman, James MacKinnon, Lauren Andrews, Alex Glocer, Knicole Colon, Thomas Zurbuchen, Kyle Hughes, Nithin Abraham, Ryan Derosa, Amir Jahromi, and Chris Scolese. Knicole Colon presents a poster about exoplanet data to Thomas Zurbuchen. On Wednesday May 16 the MOMA-MS was shipped from Goddard Space Flight Center to Thales Alenia Space in Torino, Italy to begin its integration with other instruments on the ExoMars rover planned to launch toward Mars in 2020. The MOMA instrument is provided to the ExoMars mission with a European and US teaming collaboration that integrates a Goddard linear ion trap mass spectrometer with a French provided gas chromatograph and a laser provided by Germany. The goal of this highly capable instrument is to detect and identify organic material from below the surface of Mars that is delivered to MOMA by a drill on the rover. This drill can acquire sample from up to 2 meters below the surface. At that depth organic molecules are better protected from destruction by the high energy radiation that penetrates through the thin martian atmosphere. The primary goal of the mission is to search for organic molecules of biotic or prebiotic relevance that may give us clues about possible microbial life on ancient Mars at a time where surface water was abundant. Carol Vorderman, famous UK TV host, Board Director for Challenger Center, #1 best-selling math/science education author in the UK, and Honorary Group Captain of the Royal Air Force, joins Dr. Colleen Hartman by leaping into space ahead of the TESS MISSION launch (Falcon 9/TESS in background). Safety Week, for the win! Injecting levity into the week’s serious subjects, Chief Financial Officer Steve Shinn served as host for Safety Jeopardy, a trivia contest based on the popular television quiz show “Jeopardy!”. Representatives from the Goddard's Sciences and Exploration Directorate claimed the competition’s Safety Cone Award, dethroning the two-time defending champions from the Goddard Applied Engineering and Technology Directorate. The SED team was comprised of Juri Schauerman (690) Brent Gary (698) and Ryan Smallcomb (660). Claire Parkinson has been elected to the prestigious American Academy of Arts and Sciences. Founded in 1780, the American Academy serves the nation as a champion of scholarship, civil dialogue, and useful knowledge. As one of the country’s oldest learned societies and independent policy research centers, the Academy convenes leaders from the academic, business, and government sectors to respond to the challenges facing the nation and the world. Dr. Colleen Hartman, Director, interviewed with Dr. Francesco Tombesi for the Aspen 2017 award for collaboration and scientific research between Italy and the United States. On March 26, all four science divisions presented the "Code 600 Science Year in Review," focusing on science accomplishments in calendar year 2017, to executive management. The full presentation is available (internally only) here. Congratulations to Goddard scientists Ira Thorpe and Jake Slutsky, both in 663, who are part of the LISA Pathfinder (LPF) team, which was recently awarded the 2017 Space Technology Award from the American Astronautical Society. Other Goddard employees who are on the LPF team are Jim O’Donnell, Peiman Maghami, and Oscar Hu in Code 591. Jesse Leitner in Code 300 received the Industrial Leadership Award. Harley Thronson received the AAS President’s Recognition Award for a decade of chairing the Goddard Symposium planning team. Left: Ira Thorpe with Jim Way and Carol Lane of AAS. Right: Harley Thronson with Jim Way of AAS. Click to enlarge. Colleen Hartman and Richard Kelley (662) present Professor Saku Tsuneta, Director General, Institute of Space and Astronautical Science, Japan, with a plaque commemorating the strong scientific collaboration in astrophysics between NASA and JAXA. I would like to thank the Director’s Science Committee for putting on an amazingly successful event where scientists and engineers across Goddard shared their work and made new contacts. The interdisciplinary interactions were especially exciting and crossed all four science disciplines. Click the title of this news item or the image below for more images from the poster party. Paul Newman and NASA Goddard received the United Nations' highest environmental honor - the 'Champions of the Earth' award. 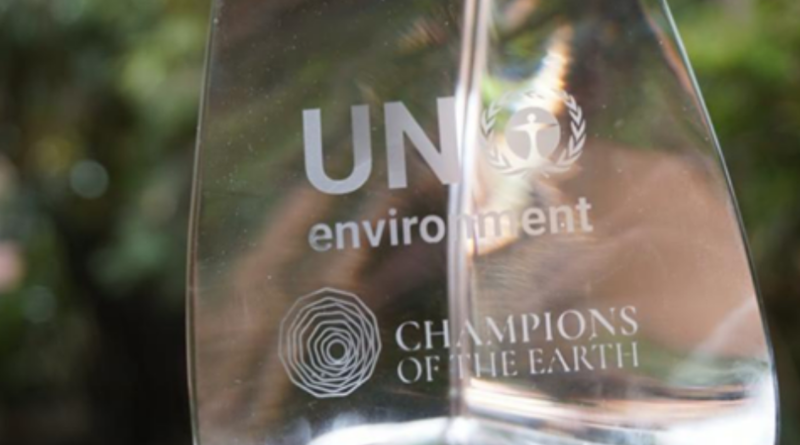 The award was announced Dec. 5 during the UN Environment Assembly in Nairobi, Kenya. 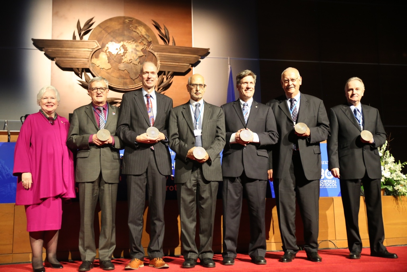 Newman and NASA Goddard received the award for their contributions to the Montreal Protocol, which resulted in a reduction of 99% of the substances which deplete the ozone layer, promoting its recovery. Paul Newman received the Scientific Leadership Award during the Montreal Protocol 30th Anniversary Awards Honour Ozone Heroes on 24 November. The awards ceremony was co-hosted by UN Environment Champion of the Earth for 2016, Leyla Acaroglu; award-winning CEO of PCI Media Impact, Sean Southey; and Grammy Awards nominee Rocky Dawuni, a Goodwill Ambassador of the Global Alliance for Clean Cookstoves, who also delivered a musical performance at the event. The awardees were nominated for their awards and selected by an international jury comprising eminent environmental leaders based on the recommendations of a technical screening committee made up of experienced ozone experts from around the world. The Ozone Secretariat only facilitated the process and was not involved in the evaluation and selection of the awardees. “I congratulate all the recipients of the awards for their extraordinary commitment and unwavering dedication to the Montreal Protocol. We also honour the contribution made by each individual, group, organization, and country towards making the Montreal Protocol a highly successful global environmental agreement that is protecting all life on Earth. We are all winners. We are all ozone heroes,” said Tina Birmpili, head of the Ozone Secretariat.